Marian Goodman Gallery is pleased to announce that we will open the 2002 season with an exhibition of Dan Graham's early films from the late sixties and early seventies. The films will be on view from Tuesday, January 8th, through Saturday, February 9th. Gallery hours are Monday through Saturday, from 10 am to 6 pm. A collection of five early films, including Sunrise to Sunset (1969); Binocular Zoom (1969-1979); Roll (1970); Helix/Spiral (1973); and Helix Spiral (Simone Forti) (1973), will be shown. First presented during one evening at the Whitney Museum of American Art in March 2001, these seminal films have rarely been exhibited as a body of work, and will be shown together as installation works for the very first time. A catalogue, Films: Dan Graham, first published in 1977 by Editions Centre D'Art Contemporain & Ecart Publications, Geneva, has been reprinted from its original edition on the occasion of this exhibition. This group of films was made between 1969 and 1973 and was produced at the same time as Dan Graham's work in the area of performance, video, and writing. As Eric de Bruyn writes in a recently published catalogue raisonné, "After 1973 Graham did not return to the actual practice of making films, but the cinematic mode of experience that was first developed in these films would remain a reference point throughout the later pavilion projects and his writing." (Dan Graham: Works 1965-2000). In the films, the variables of camera and body, place and movement, performer and spectator, and the split screen, are used to invert the conventions of classical cinema, and of our perceptual processes. As Dan Graham explains, "The philosophical base for the films with the camera attached to the eye…is that the camera was objective, being a mechanical box attached to the subjectivity of the gaze of the performer, which is also the gaze of the spectator. The spectator identifies with the performer, identifies with what the performer is looking at, which is another performer. The camera is objective, but the gaze can be both objective and subjective." The use of the two-way mirror and the reflexivity and transparency of surfaces in the later pavilion projects has an antecedent in the interplay of mutual reflections first experimented with in the films and other early works. Sunrise to Sunset (1969; 16 mm, color, 4 minutes, 20 seconds), is a landscape piece shot in Nova Scotia, in which a forward-and-reverse spiraling motion of the camera moves from a position oriented towards the sun on the horizon line at the moment of sunrise to sunset. Graham explains, "Sunrise to Sunset" also relates to the video pieces where I was putting the camera to the eye and making a feedback loop between my body and the tv monitor, that is, the tv camera wall situation." This rotating motion occurs in other films, such as Roll (1970, two Super 8 films, enlarged to 16 mm, color; 1 minute, 11 seconds), where one camera is placed stationery on the ground facing the performer who rolls from the camera's right framing edge to its left edge while attaching the other camera to his eye. Binocular Zoom (1969-1970, Super 8 mm film on a split screen, color; 1 minute, 7 seconds), was also filmed with two simultaneous cameras traversing the distance between the sun and the eye by zooming outwards. 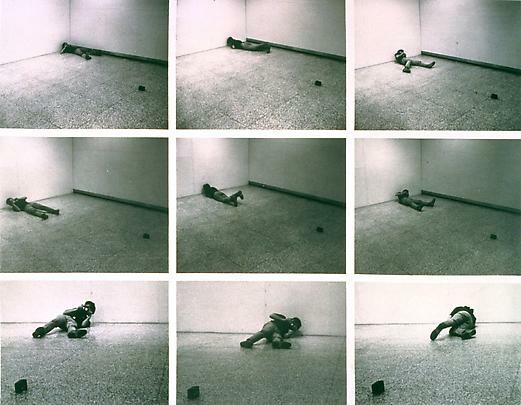 In Helix/Spiral (1973, two Super 8 mm films –enlarged to 16 mm—color; 5 minutes, 26 seconds) a stationery performer slides the camera downwards, around his body in a descending helix from eyes to feet so that the entire surface area of the body is topologically covered. As the camera rotates, circumscribing the body, it films the outside 360-degree of the surrounding space. Simultaneously, a second performer spirals around the first one while pointing his/her camera continuously at the other camera. Dan Graham was born in Urbana, Illinois in 1942 and lives and works in New York City. He was recently awarded the French Vermeil Medal by the City of Paris, 2001. This year his work has been the subject of a major retrospective survey, and an accompanying catalogue raisonné, Dan Graham: Works 1965-2001 (published by Richter Verlag), which opened last January at the Museu de Arte Contemporanea de Serralves, Porto, Portugal, and traveled to the Musee d'Art Moderne de la Ville de Paris in June. It is currently on view at the Kröller-Müller Museum, Otterlo, and will travel this spring to the Kiasma Museum of Contemporary Art, Helsinki.